1) StogieGuys.com is pleased to announce Bruce Dyk of Bismarck, North Dakota, as the winner of our most recent contest giveaway. Bruce was chosen at random from among the many Cigar Rights of America (CRA) members who left comments on our October 4 post. 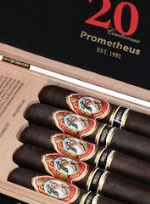 Contest sponsor Prometheus will be sending Bruce a fantastic prize: a Prometheus 20th Anniversary Edition God of Fire Serie B five-cigar assortment box (pictured) and a Prometheus Retro 20th Anniversary Lighter (combined MSRP $198). Please join us in congratulating Bruce. We would also like to thank CRA and all of its members for everything they do to support cigar rights, as well as Keith Park of Prometheus for graciously donating the outstanding prize. And remember: Even if you didn’t win this contest, it always pays to be a CRA member. 3) Following the dangerous trend of government-imposed outdoor smoking bans, officials in Orange County, North Carolina, are mulling regulations that would criminalize smoking “at bus stops, sidewalks, parks, shopping malls, and any other public domain,” according to the Daily Tar Heel. The regulations will be voted on by the county’s board at a November 20 meeting. If passed, they would apply to the entire county, which includes the campus of the University of North Carolina at Chapel Hill and the town of Hillsborough. 4) Around the Blogs: Cigar Fan fires up a Cuban Stock Royal Selection. Cigar Coop checks out a CAO Concert. Cigar Inspector inspects a Romeo y Julieta Petit Pirámides LE 2005. Tiki Bar samples a La Palina Classic. Stogie Review reviews the Dona Flor Puro Mata Fina. 5) Deal of the Week: This Midnight Madness sampler features ten premium maduros for $30. Included are five La Gloria Cubanas and five Romeo y Julieta Vintage Maduros. You guys need to fight this, in Canada the war is already lost unfortunately.